Amazon’s Fire tablets are already a bit of a steal at their normal retail price, but with the company currently offering quite a few of its products at a discounted price for Valentine’s Day, there has never been a better time to pick one up. 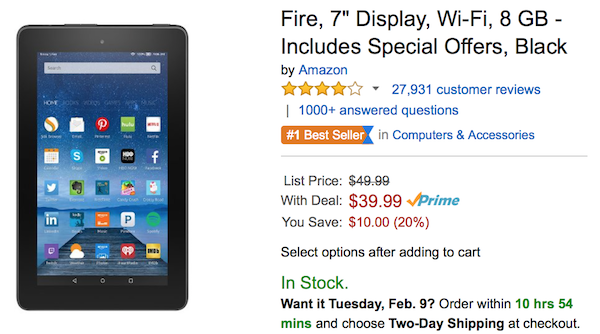 The pick of the bunch as far as we are concerned is the 7-inch Amazon Fire tablet. Normally priced at an already bargain-taste $50, those picking one up as part of the current promotion will get an additional $10 off, making their brand new tablet just $39.99. That’s not just a bargain, it’s stupendously cheap. Browsing through the Fire’s Amazon.com entry you’ll see a lot of excellent reviews for the device, with a current rating of 4.2 out of 5 stars from a massive 29000 reviews. Thats impressive no matter how you slice it. While not a workhorse of a tablet at this price, the Fire is plenty of machine for the first time tablet owner, or perhaps someone buying a tablet for a child. At this price, they’re almost consumables and there’s an argument to be made for having one in every room of the house, like magazines! You can’t do that with an iPad mini! Specifications-wise you’re getting a screen with a resolution of 1024 x 600 (171 ppi), a 1.3GHz quad-core processor, Wi-Fi, front and rear-facing cameras and 8GB of internal memory which can be expanded up to 128GB using microSD card. 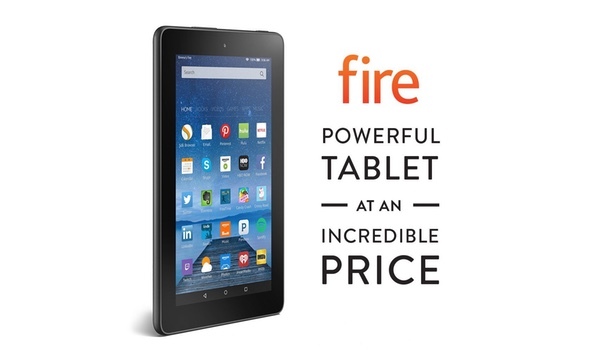 Software wise, it’s powered by Amazon’s own Fire OS, which is basically a forked version of Android. What this means is that you can install just about any Android app’s .apk file just like you would on any other Android device. None of that is going to give an iPad Pro a run for its money, but then again, at this price how many Fires could you buy instead of Apple’s flagship iPad? We’re obviously being unkind to Apple here, and you can’t compare a hugely budget conscious tablet with arguably the best in the business, but it does help to make a point – these Kindles are ridiculously cheap.